We started out as a trio: an Upholsterer, a Carpenter and a Seamstress to bring together our experience, skills and passion from our respective fields. We wanted to create beautiful products not often found on the high street. Every unique item is designed, made to order by us here in the UK. We have been in operation for a fair few years now and we have a growing client list. Listening and focusing on our clients needs is at the heart of what we do and has been an imperative part of our company’s evolution. 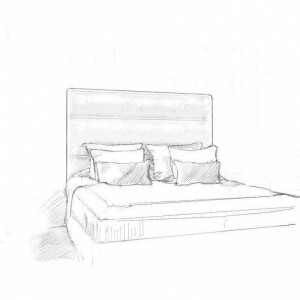 We know that whether you are an Interior Designer, Property Developer or a consumer wanting to add a luxury piece to your bedroom, you want a quality item with style. For your headboard to look beautiful on the outside it must be strong on the inside. Once your order has been placed, the underlying frame of your headboard is constructed in our workshop by us and not before. They are built using tried and tested traditional methods by a qualified and experienced carpenter and joiner. Appropriate materials are used so that they do not twist, bend or break. We never ever compromise on quality. We spend time sourcing the best fabrics at the best price for you. We have access to 1000’s of fabrics that we don’t always list on our website. If there is a particular style you are trying to replicate, let us know and we will work with you to achieve your vision. We aim to deliver our free fabric swatches within two working days. If we do not have exactly what you are looking for we can also create your order in your own fabric. Our average turnaround time is 3-4 weeks from point of order. Our lead times can be longer if delivery is in a remote part of the country. We are available to advise of current time frames if you ask at the point you are ready to order. All of our furniture is manufactured here in the UK by us. We love new ideas and we love making beautiful headboards and beds in luxurious fabrics. We are proud of our quality and designs and we are always on the lookout for new ideas. We would love to hear from you about your ideas... so get in touch.